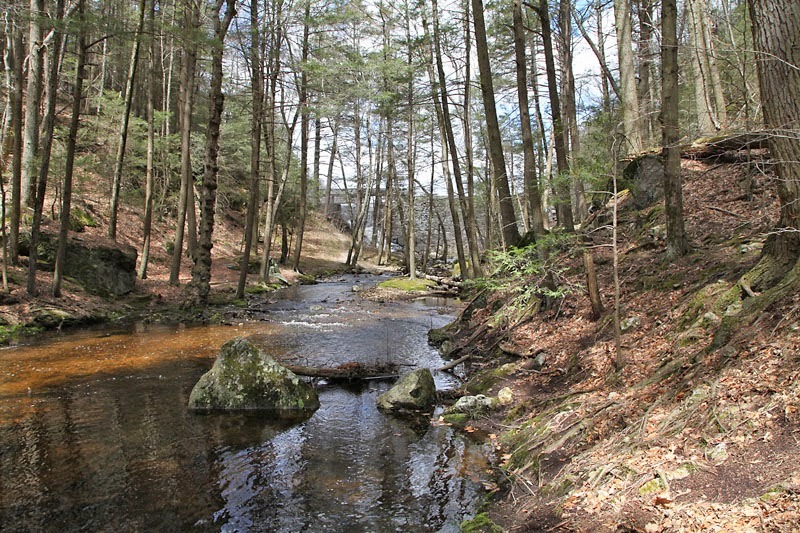 A Hidden Gem in Connecticut! This week I have been working on my flying geese quilt, hand sewing takes a lot longer but I am on the last two rows of quilting, then I can do the ties and bind it. I am trying something new with it, so once I finish, I can explain how I did it. 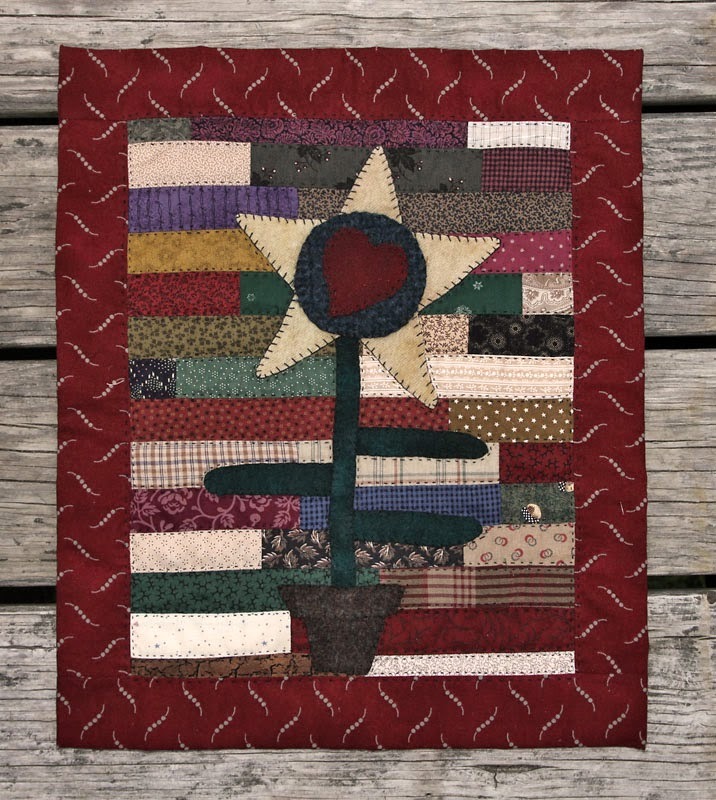 I wanted to make something quick and smaller and one quilt I have been wanting to make is Montana Majesty by Nancy of Tom Miner Quilts and Folk Art. I love the idea of doing strips with scraps but I don't have the time to make another large quilt, right now. So, I made a mini version. I used wool for my appliqué and reduced it. Then I took strips that a friend gave me from one of her log cabin quilts. I kept sewing strips together until I got a size that fit the design and sewed them together. The border is also from my friend, so I got to use up some of my scrap stash. The quilt is 17" x 14". I used #5 black pearl cotton to do the quilting and a prim stitch around the design and then in each strip and border. Next time you want to play with your scraps, try making a mini version of your favorite quilts. I also used wools from my thrift wool stash. I hope everyone had a wonderful weekend and got to enjoy some nice weather and time with friends and family. Memorial day is a time that we remember our parents, who have all passed and except for my mom, were in the armed forces. We also got out and enjoyed some nice weather between the rain storms. 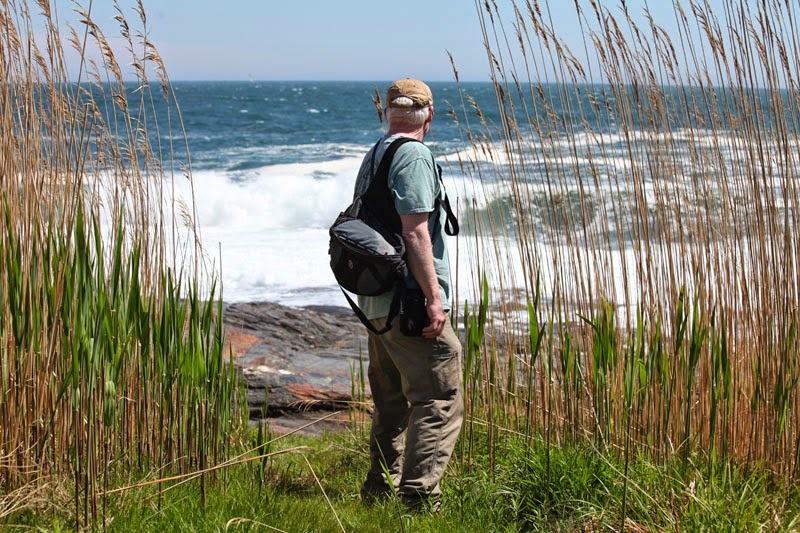 Saturday was a day for a drive to the ocean and walks at the lighthouse and then along the rocky cliffs. 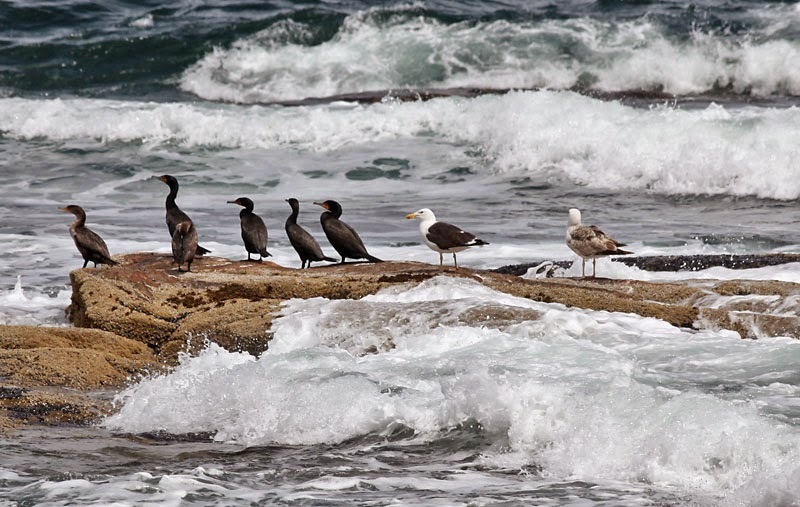 The tide was low so the seagulls were coasting on the wind, looking for tidbits along the rocks. Black Rock was the perfect place for a hike and walking around the rocks. We weren't the only ones enjoying the beautiful day. 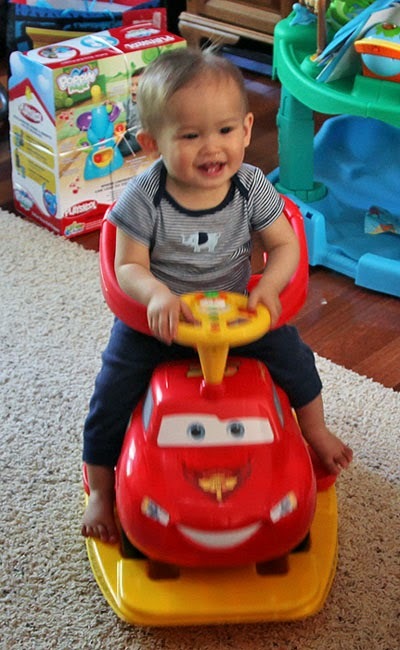 This week is Nicholas' first birthday, so Sunday was time with my sweet grandson and sharing his special day with him and the family. 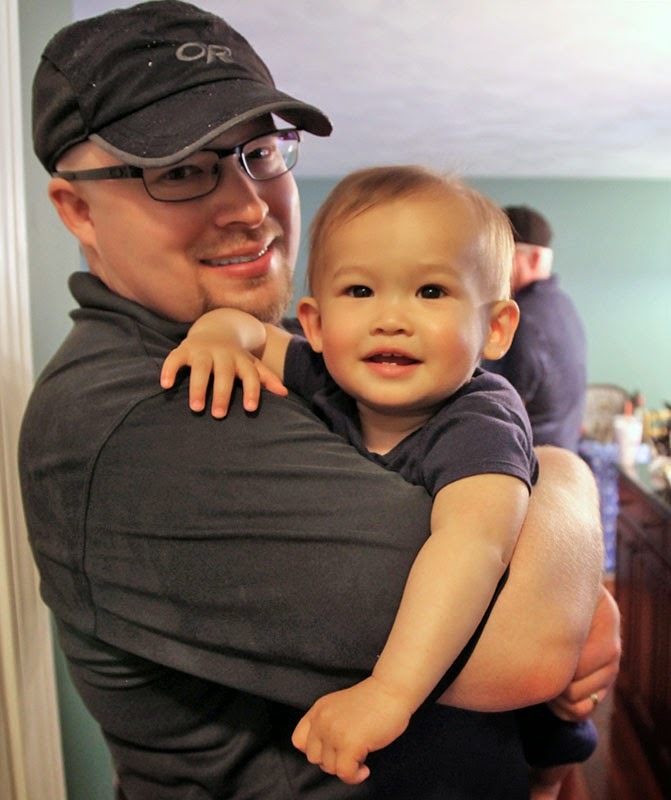 Dad and son, who I think have that same sweet smile. The fun was birthday cake, this was his smash cake, just for him to make a mess with. 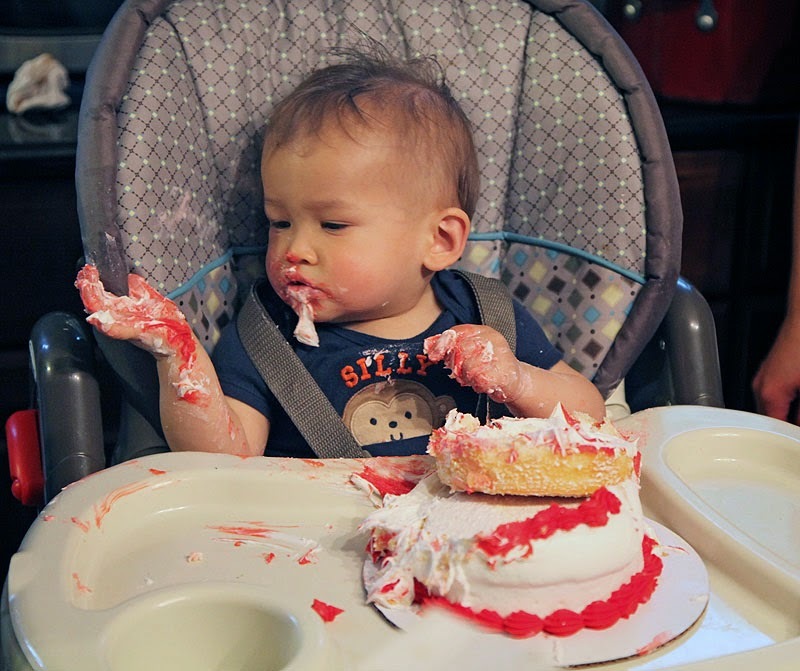 At first he started crying, then he finally realized that it was fun and tasted good too. Today we went for another walk. It was raining in the morning and then I thought it had stopped but it kept showering on us. 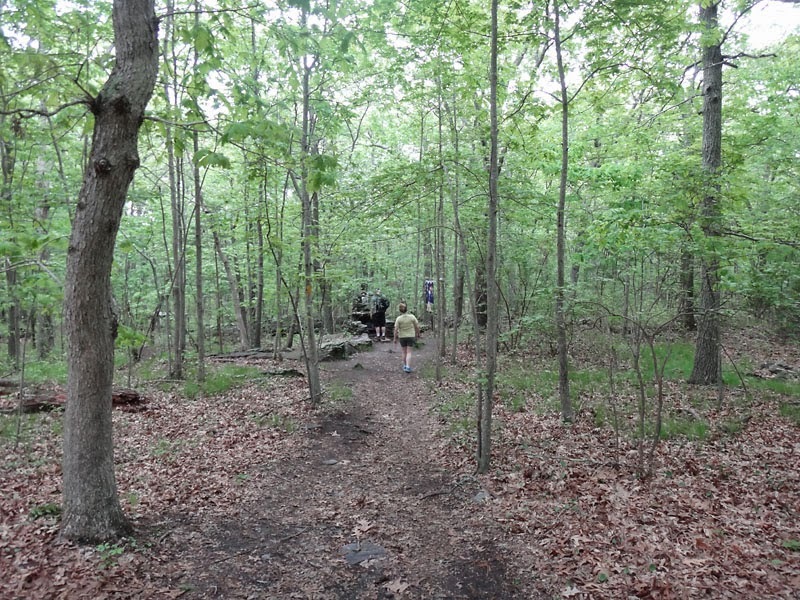 The good thing was, the woods were so thick and lush, we didn't feel it in the woods. 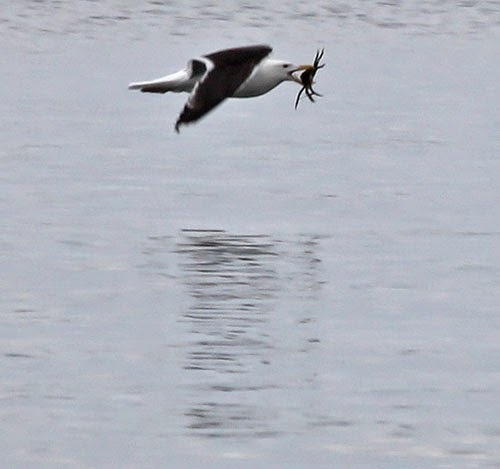 It started raining again when we hit the beach, but I decided to keep walking and was rewarded with being able to watch this guy, catching a crab in the shallow waters. I hope everyone had a wonderful weekend. This week I finished my sailboat wall hanging. The design is from a book by Sarah Sporer called One Summer at the Shore. 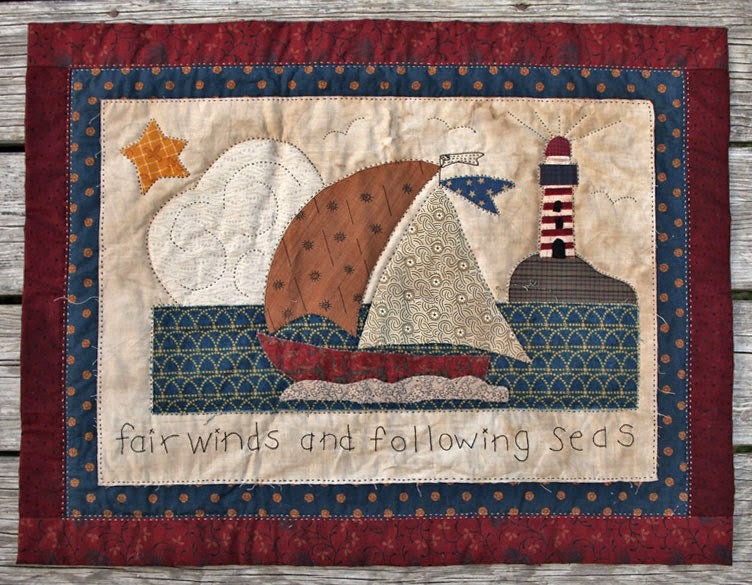 I added a few details to the lighthouse and some stitched seagulls to mine. When I finished, I added a bit of walnut stain to age the muslin more. 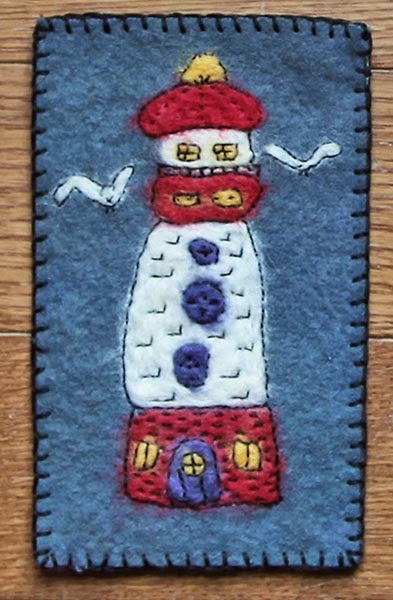 I also made a felted lighthouse for fun, a few months ago. Today I finally finished it and made it into a small case, perfect for sunglasses. I hope everyone had a wonderful weekend. 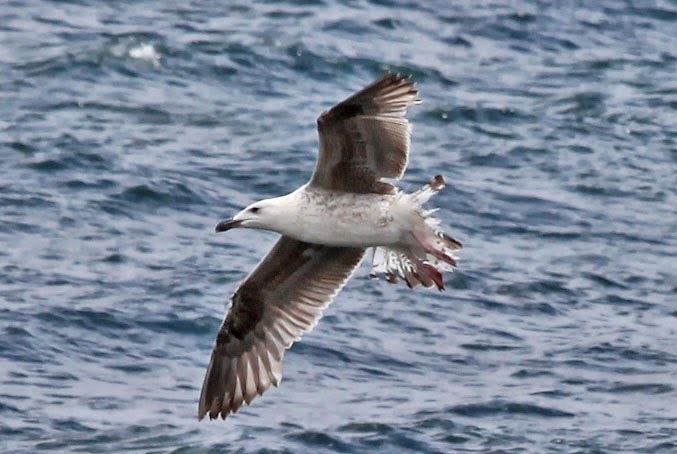 I was able to get out and enjoy the beautiful weather and fresh ocean breezes. 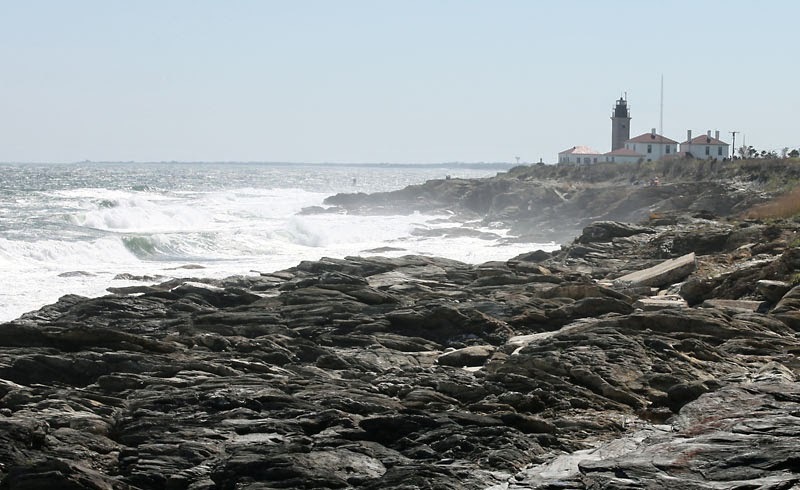 On saturday we went to Beavertail lighthouse. We had things to do so it was a nice afternoon ride and the perfect weather for a walk around the road and trails. 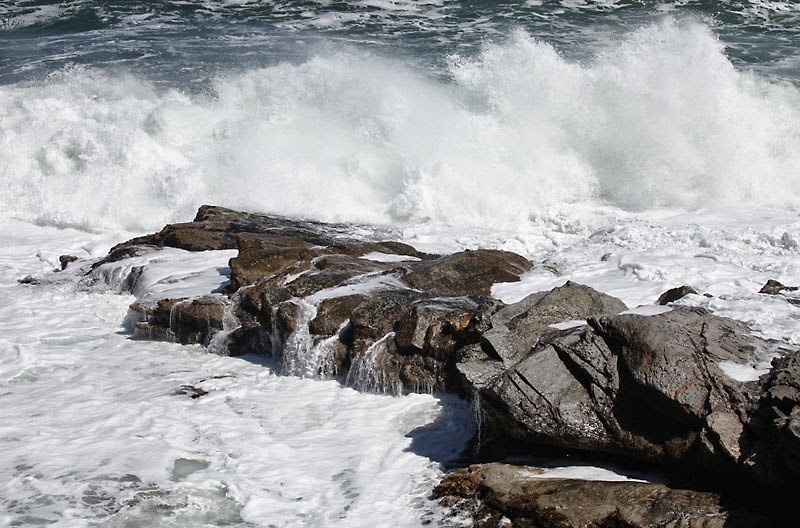 The tide was going out so the waves were rolling and crashing against the rocks. 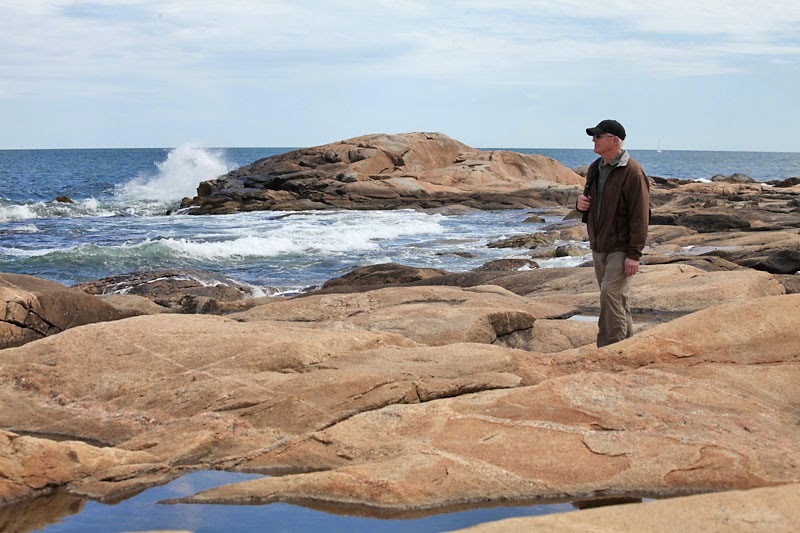 We walked further down, along the paths that follow the rocky shore. When I look at my photos, I see things that I don't notice as I take them. 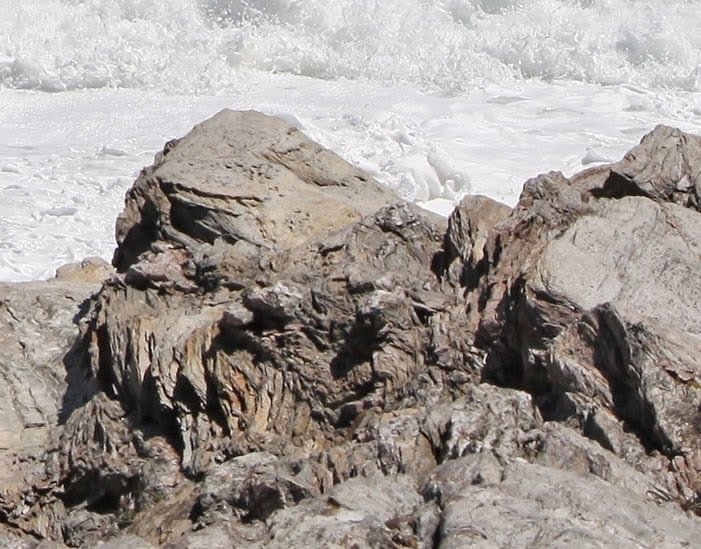 Can you see any shapes in the rocks? I love watching the water as it crashes up on the rocks, then trickles back into the sea. On Sunday we went to a Dr. John Champlain Glacier Park. It is a wooded walk along paths that follow ridges and valleys that were carved out by the receding glaciers. The walk itself was nice and peaceful and we ended by coming to a higher point with views of Atlantic Avenue at Misquamicut Beach. It was the perfect spot to stop and enjoy the views. A closer view of what we were seeing. The beach has one of the oldest carousel's and organs, still in use. Did any of you follow the 100 Blocks giveaways? 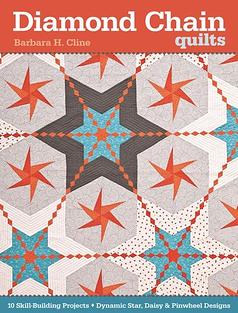 I didn't win a magazine but I was the lucky winner of Barbara Cline's book, Diamond Chain Quilts. I have to admit, I was a bit intimidated by her quilting and all of that piecing, but once I read her tutorials and watched the video, I realized, even someone like myself, can make beautiful quilts like this. I received my copy of the book and she has wonderful tutorials and photos that show how to make the quilts along with beautiful quilts to make. I love how she uses colors and turns them into quilts that have a 3D look, something I would love to try. I also love irish chain quilts and this is a wonderful new take on chain quilts. 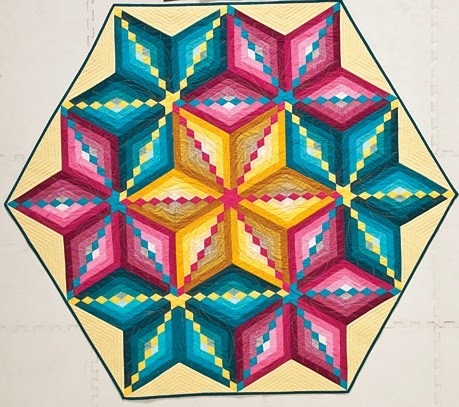 This quilt shows the effect of using color gradiations to get a 3D look, I would love to make this for Christmas. 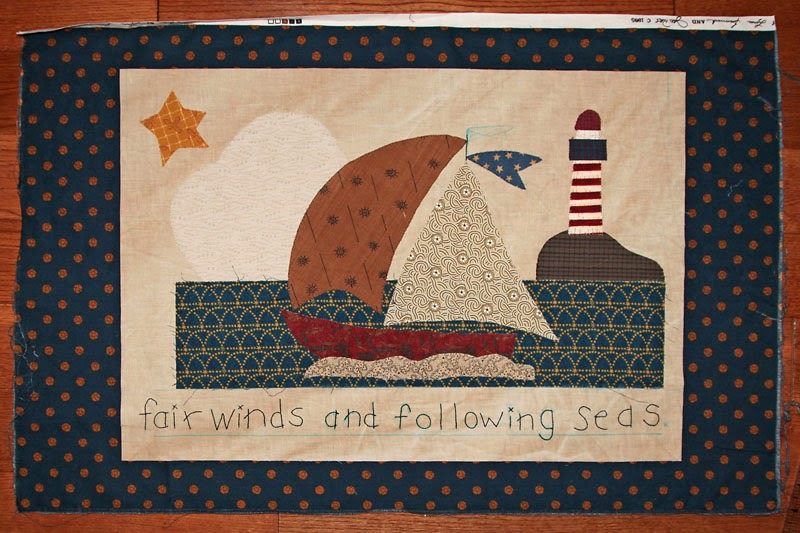 Be sure and visit Barbara's blog, Quilting Gal and learn how she makes these fabulous quilts. Another thing I started this week was a garden angel. 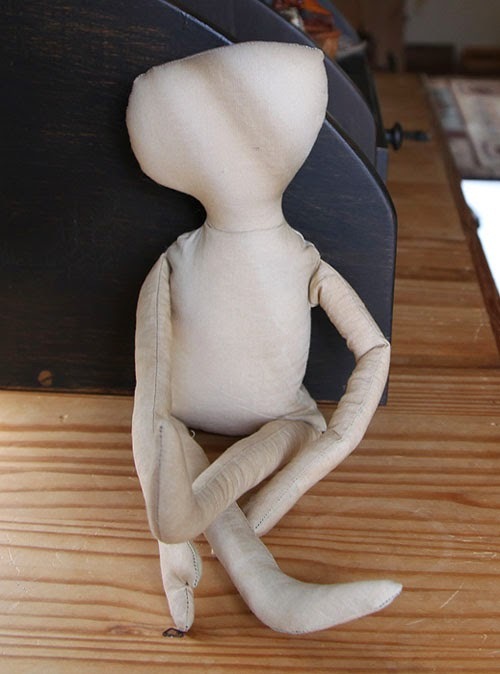 Wendy of Ravenwood Whimzies is having a challenge using her free doll pattern. She supplies the pattern and then you can design her with a gardening theme. Sounds fun and you have a month from today to finish her. I hope you can join in, on the fun. I made my body so I can stare at her and come up with ideas before I start. I am thinking simple and using some flower material for her clothes and accessories. I am not the best doll sewer, good thing she will be covered in clothing;) I used tea stained muslin, so the dark stripe is how the material went on that section. 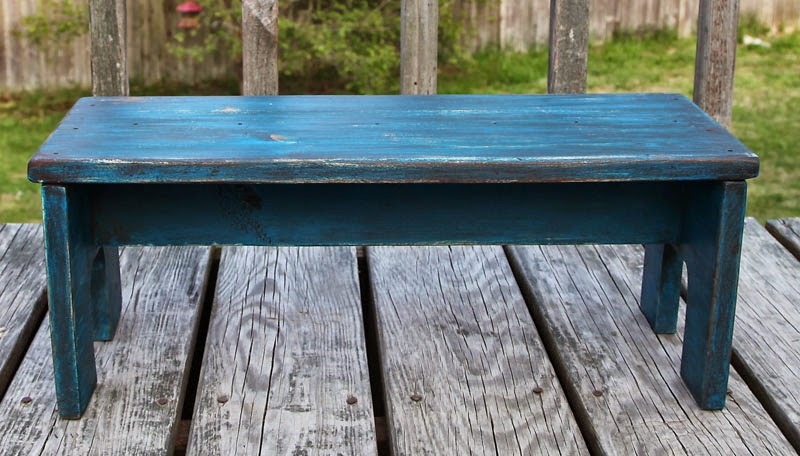 Another thing I finally did this week was to paint my bench. I wanted to do a painting on top, but I haven't had the time and I just wanted it painted. Of course I realized I had no light blues so used what I had, a bit bright and for some reason it did not want to sand down. I gave up and antiqued it and left it as is, later I can let my husband resend it and repaint it. For now it serves it's purpose, a foot stool in the bathroom. I hope everyone has a wonderful weekend. We are getting rain but it looks like we will have breaks, long enough to get out for some walks. I hope everyone had a nice weekend. We had a beautiful day yesterday, though a bit warm for hiking. The plan was to visit two places and just walk around, but we ended up hiking up to a lookout, so I got a good workout. 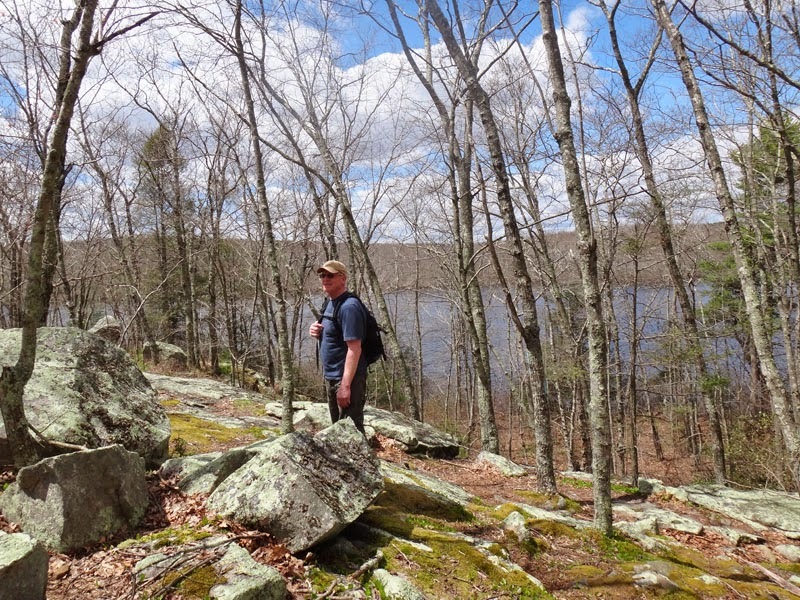 We headed to East Haddam Ct., to visit Devil's Hopyard park. I was not disappointed, the area is beautiful. Plenty of parking, and wonderful trails that follow the river and more to explore. Of course the first place I had to walk to was the falls. The recent rains had it cascading down the rocks with a roar and a fine mist cooling us off. 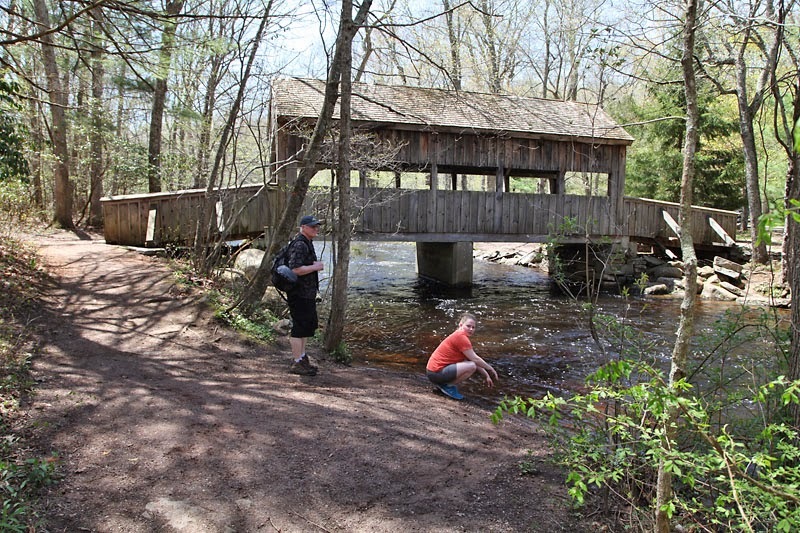 We headed to the top of the falls and crossed the bridge and headed along the trails that followed the river. The path led to a covered bridge, a nice place to stop and relax. 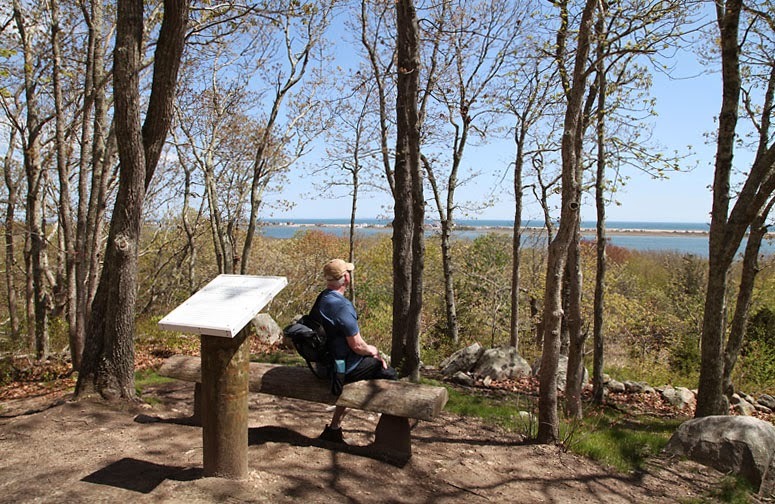 I hadn't planned on a hike or climb, but the next sign post said, overlook and I just had to see what it was, lol. It was all climbing up hill so I took it easy and was treated to this spectacular view of the valley below. I decided to take the river route, on the way back, nice and flat but a lot of areas were hard to climb over and more slippery, but it was easier and shorter, as well as having beautiful views of the river. 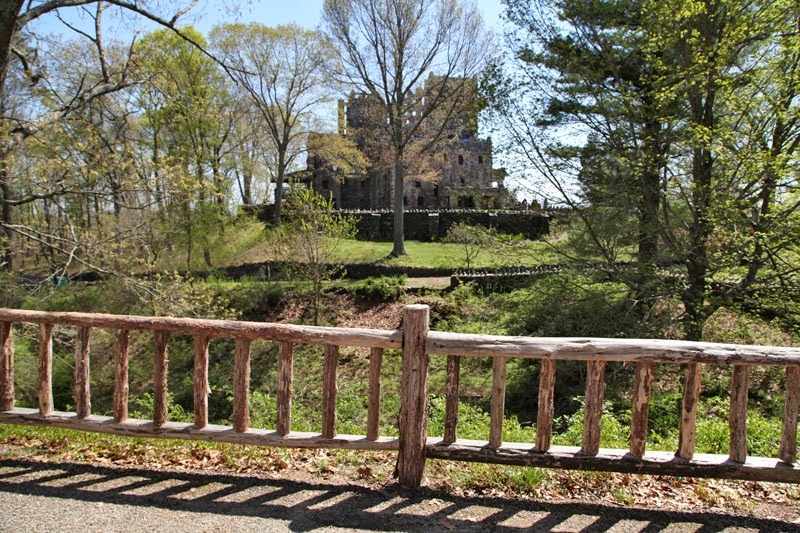 Our next stop was Gillette Castle on the Connecticut river. 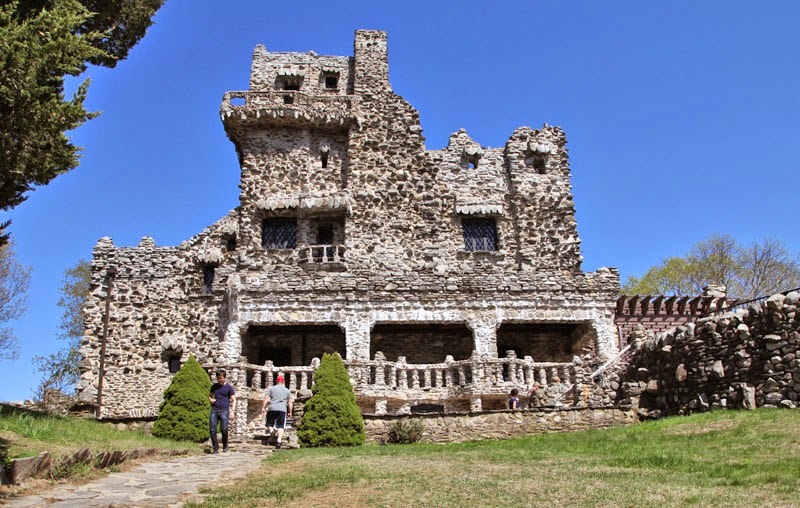 The Castle was built by William Gillette and an amazing place to visit if you are in the area. It has free parking and access to the grounds and a fee if you want to go in the castle. It was not open, so we weren't able to get in. Since it was late, we just walked around the castle. It is a place I would like to go back to and walk around the grounds which have miles of paths. Gillette was also a cat lover and I was hoping to find some of the stone cat sculptures but they are in areas we did not go to. A view of the castle as we head up. A view of the castle front, which faces the river. 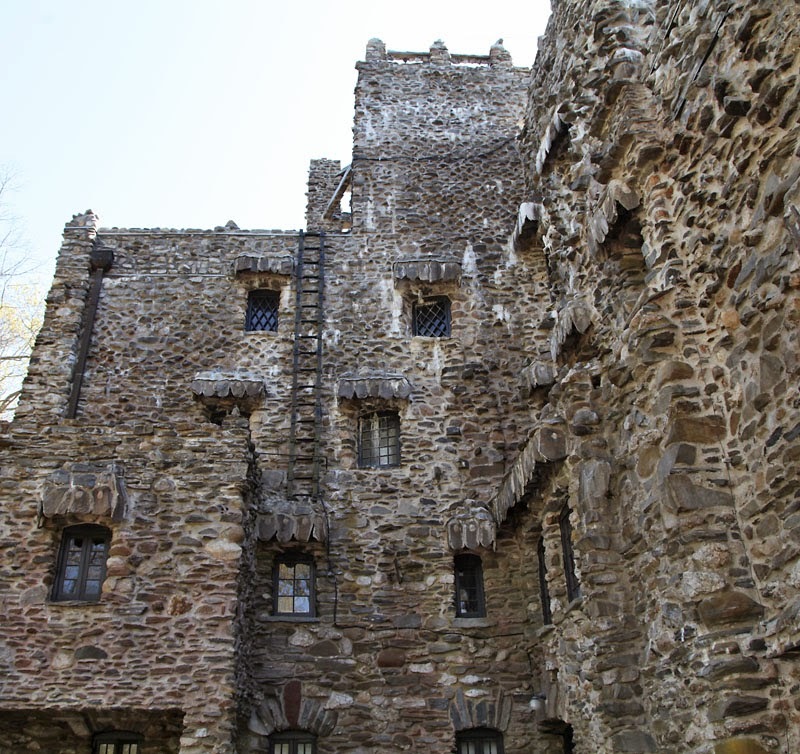 Gillette's bedroom is in the uppermost, left side of the castle. 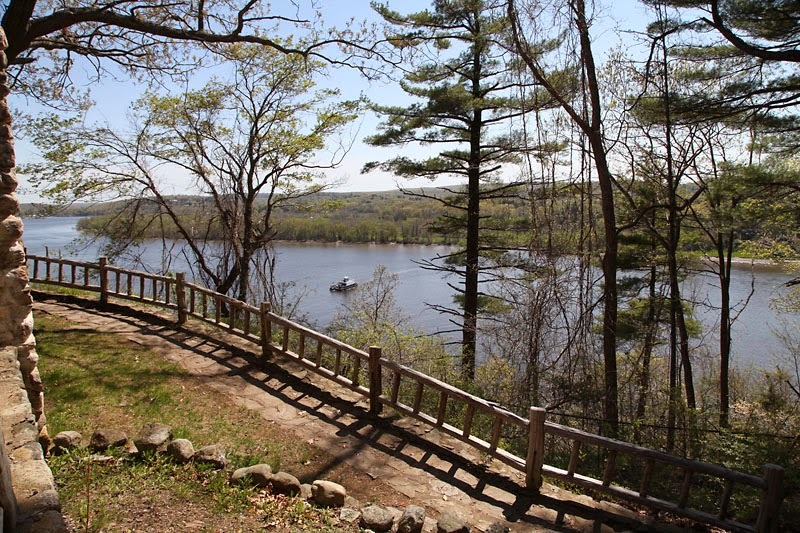 A view of the Connecticut river from the picnic area in front of the castle. You can see the ferry crossing the river, one way to get to the other side. There was also a riverboat coming up the river which is a fun way to see the area. And here is a closer look of the castle walls, can you imagine having to build this. There are a lot of unique features inside the house as well, the sun room has a pond in it, which we could see from the window. I would love to come back and go inside, take a ferry ride and go further up river to see the swing bridge and the old mill towns along the river. I started working on a new project this week and still working on it. The pattern is from a book by Sarah Sporrer called, One Summer at the Shore. I thought this would be a fun one to do for summer and I liked the scrappy look. I used scraps for mine and went a little wild with the pattern choices. The tea stained background will be sewn onto the blue background, using the raw edge of the muslin. I am not sure how it looks together, what do you think? It is a dark blue with circles that have a star in them. Once I get that on, then I will do some primitive quilting designs and use a red edge for the binding. I hope you all have a wonderful weekend and a Happy Mother's Day! 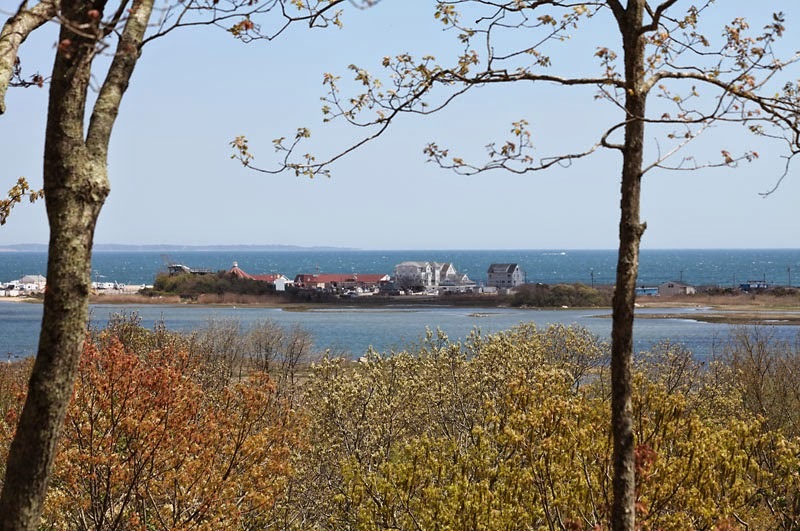 I am planning on an outing in Connecticut so hopefully the weather is nice and we can get out for the day. 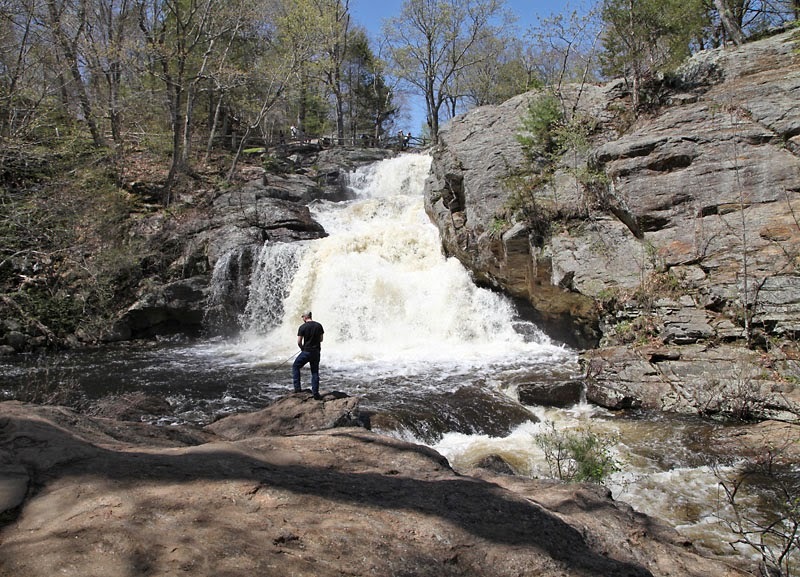 I wanted to try a new place so we went to Green Fall Park in Connecticut. 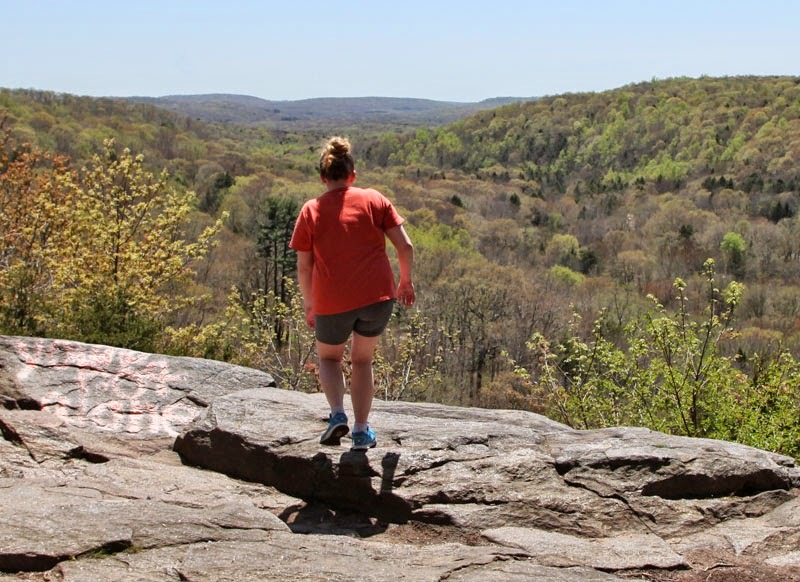 It is right over the border from the area we hiked at so not to far to travel and a beautiful area with a nice trail system that has with a diverse trail system that gives you a good workout and beautiful scenery. We started at the campground and hiked around the pond. Looking across the pond with the dam in the distance. We did a bit of climbing too, there were two trails, which I did not know at the time and of course I took the one that goes up, lol. 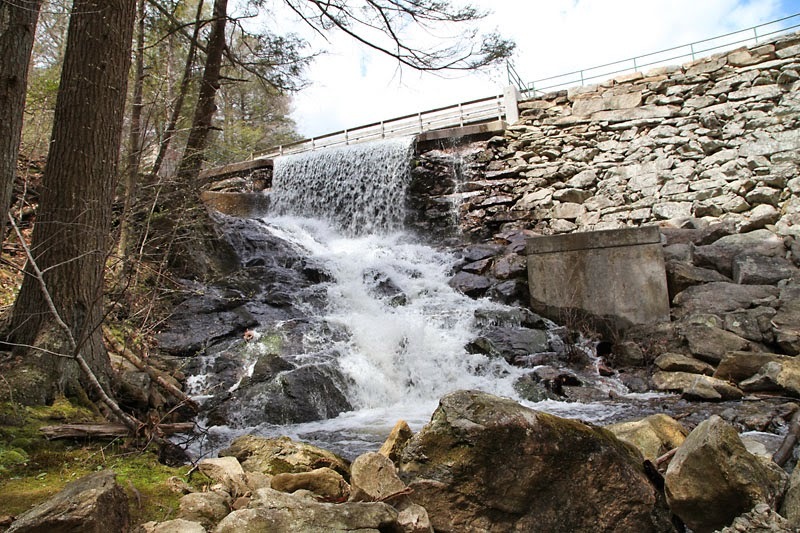 The trail follows the pond and then traverses an old levee system and comes out to the dam and waterfalls. 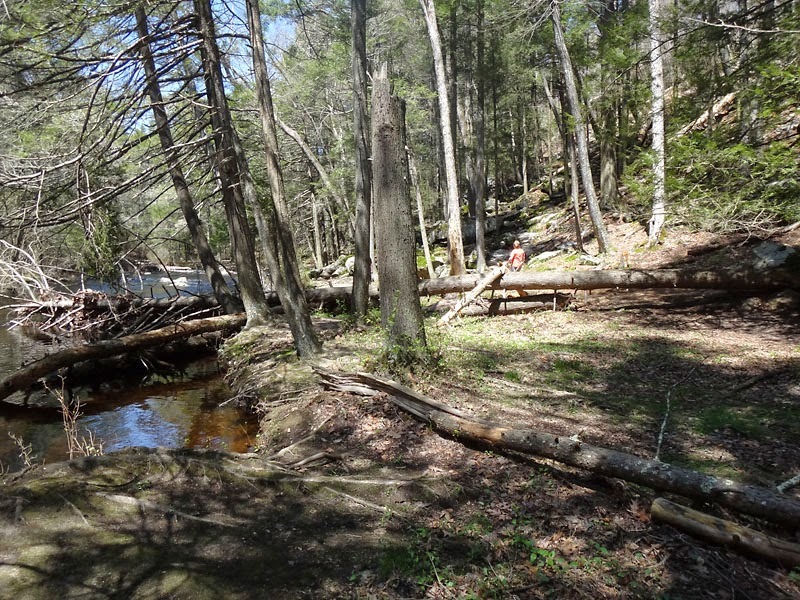 There is a trail that follows the river down, so I will have to go back and explore the other trails when I have more energy. The waterfalls were running strong with all the rain we have had, I could sit and watch them for hours. 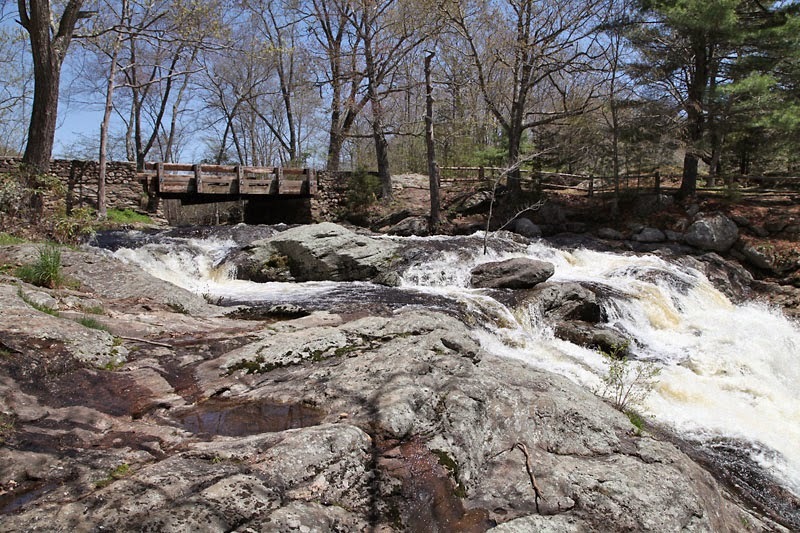 At the falls there is a bridge and a grassy area, a perfect place to stop and take a break and enjoy the views. It was a beautiful day for hiking and a place I will come back to. 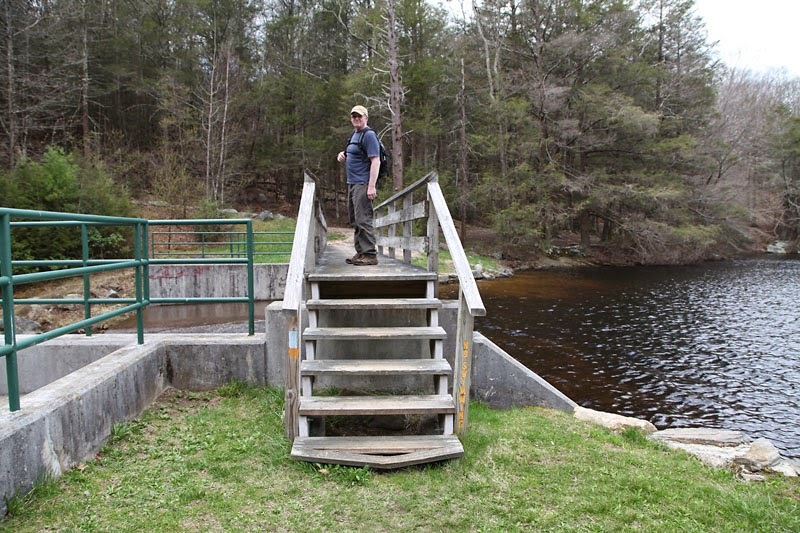 They also have a kayak launch, so maybe next time we will enjoy a paddle. I haven't gotten a lot done this week, resting from my rib injury and today I was finally able to get the house clean. 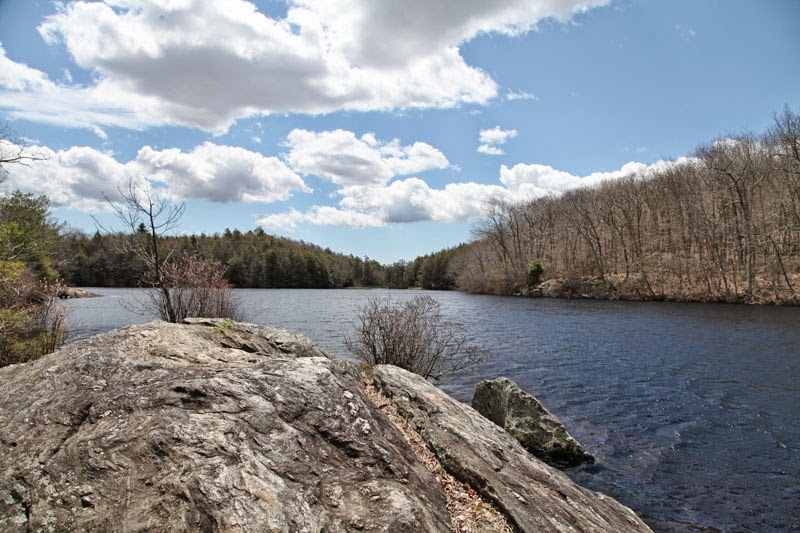 I am hoping I can get out tomorrow, maybe even a paddle since the temps will be in the 60's. I finished the stitching on my Spencerian stitchery but I haven't decided how I want to finish it, so I put a photo frame on it. It does look nice framed. I lightened it up a bit so it looks whiter than it is. 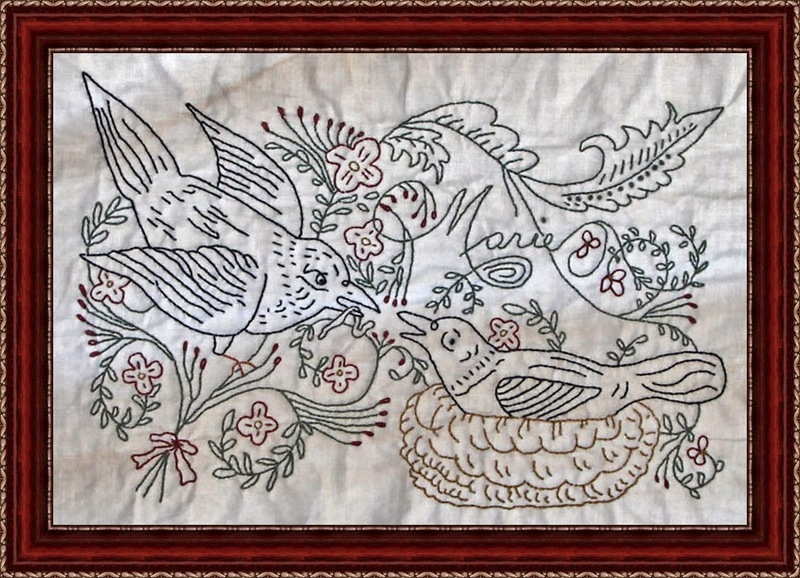 I didn't antique it, but it is stitched on tea stained muslin. I was afraid the details might get lost if I darkened it with walnut stain. If you are looking for something fun and free to make this weekend, here are a couple of websites that have new projects that you might like to make. They also have other free patterns so check out their back posts. A fun strawberry pillow can be found at Scrap Quilt and Stitch. It is done in wool, so a quick project to do over the weekend for some summer bowl fillers. Zulu and Co has a wonderful bag that would be fun to make and a great gift idea. She offers a template for the pattern, but you will have to figure out how to sew it yourself. It is a simple design, so it wouldn't be hard to figure out.